Since the beginning of mankind, civilizations have fallen: the Romans, the Greeks, the Aztecs… and now us. Huge earthquakes rock the world. Cities are destroyed. But something even more awful is happening: An ancient evil has been unleashed, and it’s turning everyday people into hunters, killers, and crazies. This is the world Mason, Aries, Clementine, and Michael are living in—or rather, trying to survive. Each is fleeing unspeakable horror, from murderous chaos to brutal natural disasters, and each is traveling the same road in a world gone mad. Amid the throes of the apocalypse and clinging to love and meaning wherever it can be found, these four teens are on a journey into the heart of darkness—and to find each other and a place of safety. Blurb: Drew me in. Genuinely scary, fast-paced, and thought-provoking. 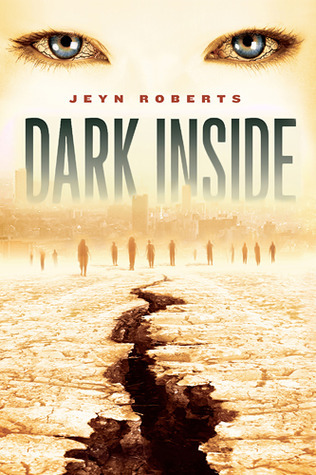 Review: I suppose I just have a thing for apocalyptic books, because Dark Inside earns the same four drops of water that This is Not a Test earned, but outside of personal preference, this book really deserves its high rating. I read this book on my flight home to Detroit and normally I get air-sick reading, but I was so drawn to the book that I finished it easily, pausing to dry-heave only once (Only kidding; I managed to keep my insides where they belong the entire time). I found myself eyeing my the young couple next to me and their tiny newborn with careful interest, wondering what would happen if "The Dark" was to suddenly take hold of the people on my flight. For some reason, many of the books I've read lately just haven't managed to capture my interest and really draw me in, but Dark Inside was the type of book that involved me. I was fascinated by the premise of a mysterious darkness that seemed to be harnessing the darkness already residing inside the souls of much of humanity. It was genuinely scary without being unimaginable and made me consider the state of humanity without being too preachy. It was thoughtful, simple and fast-paced and despite its character switching (each chapter focused on one of about four different people), it still managed to make sense. I didn't have to double back to check on who a character was (one of my biggest reading pet peeves). Honestly, I can't even think of anything at the moment to critique; it was just really good. So that raises the question as to why I didn't give it five water droplets. Five stars would be akin to Harry Potter, in that I literally tear-up when I reach the end because it makes me hideously sad that there will never be any other books. So while Dark Inside was vivid, semi-deep and crazy (violence levels might not be appropriate for younger audiences), the end didn't make me cry. In fact, I was actually quite relieved when it ended in just the right (and somewhat expected) place; my terror quota was easily filled. The last third of the book did follow a very common apocalyptic plot line, but it was so well done that I didn't even care. If you're a slower reader or don't have a lot of time to devote to the book in one sitting, you're more likely to get the characters and their separate stories confused, but other than that, I would recommend this to any lover of apocalyptic fiction. I was reading a copy that Enna loaned me, but I went out and bought my own copy; It makes a nice addition to my "End of the World" book collection. River is a regular guest reviewer on Squeaky Books. Follow her on twitter!